Happy May! I’m so excited to introduce you to our Hello, Breakfast! Kit this month! Mother’s Day and the end of the school year are on my mind, with dreams of more relaxed days just peeking around the corner, where my family can start the day together, at ease, with delicious, boisterous breakfasts. There’s nothing better than the hubbub, the laughter, the tickle fights, all in pajamas while wielding whisks and spatulas, and at the end of it all a hearty delicious meal to share as a family. Even if we can squeeze in one or two of these special days over a month, it’s a dream I cling to! How about you? So, let’s dive in to the good stuff in this kit! Our recipes this month have fun names, trendy twists, and are going to become standards in your home. And something else that is worth noting- the grocery list this month is full of staples. Check it out. I am going to guess you have 100% of these items in your home right now. Woo hoo! Strawberry Sundaes. Okay, this is not a trick! Yes, they’re called sundaes to tempt the kiddos but they are really healthy (and equally delicious) yogurt parfaits packed with fruit and granola (pssst…I often use a healthy store-bought variety but it’s surprisingly easy to make a batch of fresh granola at home)! This is such as simple, fresh, and tasty recipe, I really can’t say enough about having it in your family arsenal for a quick morning breakfast (p.s. Here are some more great ideas for Breakfast on the Run) or a more loungy day with multiple courses. A little unexpected benefit: these make amazing after-school snacks. If you are hosting a playdate, it can be a great activity/snack that the kids make themselves. Sunny Scones. Yes, yes, yes! Who knew this coffeehouse treat was so easily make-able. I did not until we worked on this straightforward, fool-proof recipe for awesomeness. So beautiful, so fancy, so do-able. I have received notes from seasoned bakers telling me that this particular recipe is going in their repertoire, and how it was such a great way to get the little ones in their family engaged in their craft. So do not wait, please make NOW! I love all our breakfast recipes, but my all time favorite is Sunny Scones … you’ll be serving this to your mommy-friends long after your junior chefs have mastered the recipe! P.s. Once you’ve got the basic recipe down, step it up a notch with some home-made (and quick) Strawberry Jam! Egg-cellent Cupcakes. I love eggs. I don’t know if everyone does, but I do. Sunny side up, boiled, scrambled, in a nest, you name it. But sometimes I want a little more something-something in my eggs. These are basically mini-quiches disguised as cupcakes in cute little baking cups. The idea is to get the basic steps across to kids so they understand how fun it is to get creative in the kitchen, using what they like, what’s in season at the farmer’s market or grocery, and even how best to use up those little tid-bits of this and that left in the frig at the end of a week. Once you’ve got them baked up, add some breakfast themed cupcake flags for some extra flair! 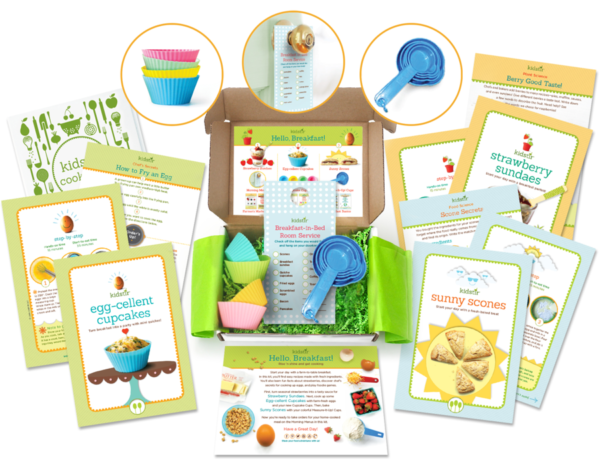 You know a big part of the fun each month upon opening up our kits are the kid-friendly cooking tools and activities inside. Here are the goodies this month! Cupcake Cups. This month you’re getting 4 silicone baking cups in your kit- 8 if your subscription includes the sibling upgrade option! These cups are great for a few reasons. First, they are just the right size- not too huge, not too little. They are bright and colorful. They are made of silicone which is super easy to wash in the dishwasher, and reusable for ever (less waste than those paper ones). They are also naturally non-stick, so you don’t have to pre-coat. They work well in a huge range of temperatures- you can use them to bake, but also to freeze! And, they’re super handy for other uses- like when you’re setting up mise-en-place with various spices – or serving something that uses different types of toppings (for our Breakfast Bites, put out nuts, raisins, cereal…yum) ! Measure-It-Up Cups! Well what I can say except you gotta love classics! We thought this blue was so pretty that it would just entice all the little chefs right into the kitchen. Markings are in both US and Metric (who knows, maybe your junior cook will go to Le Cordon Bleu some day!). So throw on your Kidstir apron and start mixing up some Berry Good Crepes already! So far we’ve just discussed the recipes and tools in the kit –don’t forget all the great Foodie learning tucked within those recipe pages. There’s so much more great stuff for you to discover—a berry taste test activity good for scientific thinking and vocabulary development, a fact sheet about strawberries (do not wash any berries you don’t plan to imminently eat- they will mold! ), an activity for kids to match the foods they eat with their origins (where does flour come from?) –and a unit on world food culture (hello, vegemite!). There’s also a tutorial on all the ways to fry an egg and the tons of uses for your new silicone bake cups. And then there are all the additional recipes and activities you can get online to complement what’s in the box that you can find on our DIY page. My #1 tip: keep up a jar full of our Best Ever Quick Pancake Mix in the pantry and you will never use packaged pancake mix again. And then gift some of these jars to teachers, counselors, friends! They will love you! 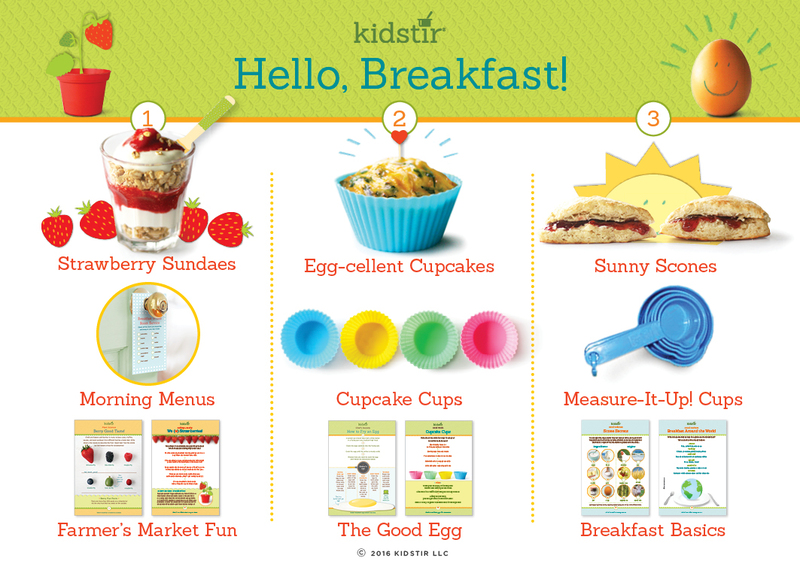 I am so excited about making and re-making all the recipes in our Hello, Breakfast! Kit. I hope you are too! Please do share all your fun experiences, and tips and tricks, with us on Facebook, Instagram, Pinterest, and Twitter. We love letters with photos too, which you can send to email hello@kidstir.com.